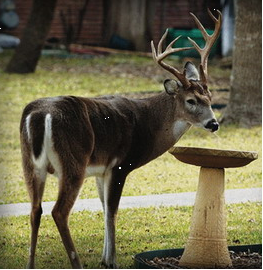 Struggling with the ever-increasing impact of deer browsing on ornamental plantings. Over the years I’ve seen my working list of ‘deer resistant’ plants dwindle as the deer pressure grows in the broader Chapel Hill area. I have begun to take action as many other residents have done by installing fences to keep the deer out of parts of our yards. To date I have installed deer fences in well over a hundred properties, from 900 square foot-vegetable gardens to sixteen acre-parcels. I have developed my own hybrid fencing system using materials and techniques from different manufactures to install reasonably priced, reliable, functional, and aesthetically acceptable deer fences for the suburban residential and rural landscapes. Perhaps it is time that you consider installing a deer fence and begin to grow those wonderful plants that you gave up having. The list is extensive but might I suggest hydrangeas, hostas, azaleas, daylilies, tulips, roses, vegetable gardens and fruit trees, and so much more. Please contact me for further information or an estimate.